Ruth retired after spending 24 years working as a Public Health Nurse in Wyoming, the last 10 of those years in Powell. Her areas of interest included maternal/child health, especially working with first-time mothers in the Nurse Family Partnership Program, providing health consultation to local child cares, and serving in Meeteetse in positions of school nurse and an immunization advocate for children and adults. Ruth has been involved in community health planning for over 15 years with the Park County Health Coalition, Park County Coalition Against Substance Abuse, and other coordinating organizations. 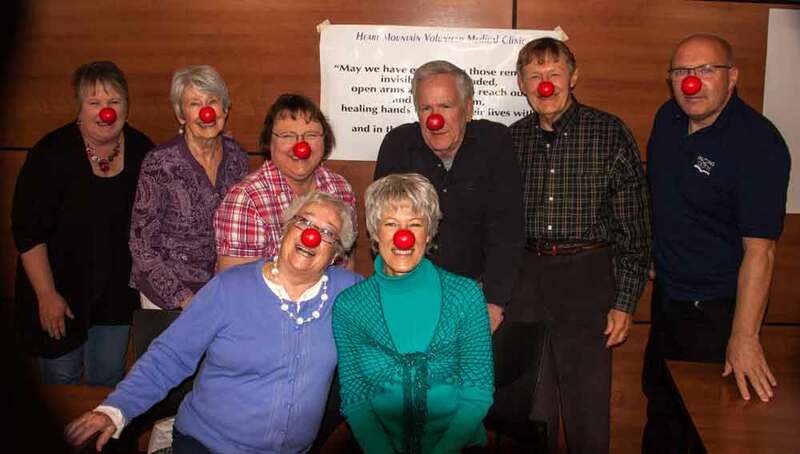 She was one of the original organizing committee for Heart Mountain Volunteer Medical Clinic. After graduating from Utah State University with a Ph.D. in psychology, Theo worked as a psychologist in Montana, Wyoming and the Marshall Islands. A majority of that time was spent at West Park Hospital, Park County Mental Health Center (Yellowstone Behavioral Health Center), and private practice in Cody, WY. Theo is partly retired but continues to do psychological testing for the Wyoming Department of Workforce Services. Since the health care environment is constantly changing, she applied to become a board member for the Heart Mountain Free Clinic to gain more information about current medical needs, to find and support ways to finance the clinic, and to use her psychology background when needed. Theo is pleased to be part of a dedicated team of volunteers who give their time and share their knowledge to serve patients in the Big Horn Basin. Randy is a husband, father of four and grandfather of eight, three of which are triplets. He grew up in Powell, Wyoming. After college he lived in Billings and Missoula before returning to Wyoming, and has now lived in Cody for 18 years. He is an independent financial advisor with offices in Cody and downtown Billings. He enjoys sports, waterskiing on Big Horn Lake and flying for business and pleasure. He spends most of his spare time with his children and grandkids, who are spread out across the country between Wyoming and Florida. Georgina Hopkin graduated from Nebraska Methodist College of Nursing in Omaha with an RN, where she worked in Orthopedics, Neurology, and Neurosurgery and was an assistant head nurse. She received a BSN from Clarkson College of Nursing in Omaha in 1983, and while managing a busy Open Heart Critical Care Unit, earned a Masters degree in Public Administration and a Graduate Certificate of Specialization in Gerontology from the University of Nebraska-Omaha in 1989. In 1997, she earned a PhD in Community and Human Resources with a tract in Educational Gerontology from the University of Nebraska-Lincoln, and was an adjunct professor of Advanced Nursing and Leadership and Management at Methodist College of Nursing for a time. In 2009, she earned a Master of Science in Nursing degree from the University of Phoenix, and took several classes toward being a Nurse Practitioner from The University of Massachusetts-Boston. She is a member of Golden Key National Honor Society and the Omnicron Delta Chapter of Sigma Theta Tau International Honor Society of Nursing. She has been on several boards of directors, including Condon State Bank in Kansas, works on call at a financial brokerage firm, and owns several businesses in retail and real estate. Dr. Anderson graduated from the University of Minnesota Medical School in 1972, and completed his internship and residency in internal Medicine in Michigan. Upon moving to Wyoming, he worked on the Wind River Indian Reservation in Indian Health Services. In 1978 Dr. Anderson moved to Cody where he was one of the first two internal medicine specialists to practice. After 10 years he moved to Billings, MT where he was associated with St. Vincent Health Care. Approximately three and a half years ago he moved back to Cody and presently works for West Park Hospital. Dr. Anderson is a regular provider with HMVMC, and joined shortly after the opening of the Cody branch in 2010. Dr. Anderson has been practicing medicine for 36 years and is board certified and a fellow of the American College of Physicians. Steve is an ordained pastor serving four churches in Wyoming and employed by the Rocky Mountain Conference of Seventh-day Adventists. In addition to his pastoral ministry, he is the President of The Hope of Survivors and an international speaker on clergy sexual abuse. Steve holds a degree in Social & Behavioral Sciences and is a Board Certified Biblical Counselor (BCBC) through the Board of Christian Professional and Pastoral Counselors, a member of the American Association of Christian Counselors (AACC). Ruth retired after spending 24 years working as a Public Health Nurse in Wyoming, the last 10 of those years in Powell. Her areas of interest included maternal/child health, especially working with first-time mothers in the Nurse Family Partnership Program, providing health consultation to local child cares, and serving in Meeteetse in positions of school nurse and an immunization advocate for children and adults. Ruth has been involved in community health planning for over 15 years with the Park County Health Coalition, Park County Coalition Against Substance Abuse, and other coordinating organizations. She was one of the original organizing committee members for Heart Mountain Free Clinic. Randy Feusner is a husband, father of four and grandfather of eight, three of which are triplets. He grew up in Powell, Wyoming. After college he lived in Billings and Missoula before returning to Wyoming, and has now lived in Cody for 18 years. He is an independent financial advisor with offices in Cody and downtown Billings. He enjoys sports, waterskiing on Big Horn Lake and flying for business and pleasure. He spends most of his spare time with his children and grandkids, who are spread out across the country between Wyoming and Florida. Linda is a Nationally Certified Human Resources Professional. She has worked in the HR field for over 10 years and worked for Cody Regional Health (CRH) for 17 years. Working with CRH she has worked with volunteers and planned numerous events. Linda was looking for a way to give back to the community she loves and felt that serving on the board of HMFC fit perfectly. She has two grown sons and a grandson she is very proud of. Her other interests include; fishing, hunting, kayaking, horseback riding and any outdoor adventure. Georgina Hopkin graduated from Nebraska Methodist College of Nursing in Omaha with an RN, where she worked in Orthopedics, Neurology, and Neurosurgery and was an assistant head nurse. She received a BSN from Clarkson College of Nursing in Omaha in 1983, and while managing a busy Open Heart Critical Care Unit, earned a Master's degree in Public Administration and a Graduate Certificate of Specialization in Gerontology from the University of Nebraska-Omaha in 1989. In 1997, she earned a PhD in Community and Human Resources with a tract in Educational Gerontology from the University of Nebraska-Lincoln, and was an adjunct professor of Advanced Nursing and Leadership and Management at Methodist College of Nursing for a time. In 2009, she earned a Master of Science in Nursing degree from the University of Phoenix, and took several classes toward being a Nurse Practitioner from The University of Massachusetts-Boston. She is a member of Golden Key National Honor Society and the Omnicron Delta Chapter of Sigma Theta Tau International Honor Society of Nursing. She has been on several boards of directors, including Condon State Bank in Kansas, works on call at a financial brokerage firm, and owns several businesses in retail and real estate. Ann began working with people with disabilities when she was 19 years old. In working toward a career in human services, she obtained a Master’s degree in Education Counseling and a Masters in Rehabilitation Counseling. The last 13 years of her career has been working with employment options for people with disabilities. She is currently on the WY Advisory Panel for Students with Disabilities and works with other State agencies and service providers to facilitate service delivery for students with disabilities. In working with these groups Ann recognizes the need many of our youth have for quality, available and consistent healthcare. Her interest in HMFC is to continue growing connections to help our community and to ensure that healthcare is not a barrier to other life choices. Jack graduated from the Massachusetts Institute of Technology in 1969 with a master's degree in electrical engineering. He worked as an engineer and manager in the aerospace industry until 1996, when he made a career change to healthcare information technology. He has served as CIO at Washakie Memorial Hospital in Worland, WY, and retired in 2007 as director of information technology at West Park Hospital in Cody, WY. Since then Jack has continued a part-time business as an IT consultant, and he assumed the position of executive director of HMFC in 2014.